Over the coming months I’ll be celebrating the earlier titles in the Kydd Series, it’s Tenacious for this blog. I’d love to hear your thoughts on the book, either as a first-time reader or if you’re a re-reader and have read it more than once! It’s very gratifying for an author to be told that his work has inspired people to go back and read it again. And some of you have told me you have done this more than twice! Either reply to this blog or email me. Every respondent goes into the hat for a chance to win a special mystery thank-you prize. ‘Fans of Napoleonic naval action will certainly enjoy sailing with Lieutenant Thomas Kydd, RN in Stockwin’s sixth book in his Kydd Sea Adventure series. Set in the Mediterranean during the French expeditions against Egypt and Syria, Kydd’s service in H.M.S.Tenacious takes him to Toulon, Minorca, the Battle of the Nile, and the siege of Acre. Along the way, he encounters the always intriguing Lady Hamilton, the equally fascinating Admiral Nelson, and the largely forgotten but indefatigable defender of Acre, Sir Sidney Smith. The original Band of Brothers were all captains at the battle of the Nile, and they were the elite of the Navy. They had known Nelson for a number of years and there was a unique trust and understanding between them. This was not repeated in the same degree in any other fleet Nelson commanded. But not all of the Nile captains were equally close to Nelson. We now know that there was an inner circle who he consulted regularly and they then conveyed the results of the consultations to the remainder by various means. But this inner circle was not static. Of the original Nile captains, only Hardy served in all Nelson’s later battles. Ball, for example, became governor of Malta and Miller was killed in an accidental explosion at the siege of Acre. The dramatic painting on the book’s cover which features the French flagship L’Orient exploding at the Battle of the Nile and the small boat with Kydd aboard picking up survivors was painted by Geoff Hunt RSMA. When he created this artwork Geoff had not painted L’Orient before, although he had depicted the Battle of the Nile. He told me he was not aware of any existing plan for this huge ship (though he thought there might be one in a French archive) but French designs tend to be standardised so he felt justified in using the plan of Commerce de Marseilles which the British captured at the fall of Toulon in 1793. Tenacious has been published in the UK/US in English, in translated editions and in ebook, large print and audiobook. I have to say Tenacious stands out as a favourite of mine. I listened to the audiobook while hiking near the Yorkshire moors last summer, the memory of listening Kydd’s siege of Acre while walking through the forest is one I shan’t forget easily. I am now in your ‘re-re-reader’ category for your earlier works, Julian. My favourite is your first. – ‘Kydd’. I re-read them in order, of course. For some reason, I have always passionately loved stories about people who make something from nothing – Who start from the bottom and make it to the top. Be it a story such as yours or Jeffery Archer’s ‘Kane And Able’ series or another naval author – Dewey Lambdin (Although, I wish he’d stop calling it a ‘bosn’s pipe, dammit!). I am also reading your books differently, now that I am working on my first creative fiction/non-fiction book. Anyway Julian, thanks for your good works and good words. Best to your wife. PS. Off back to Africa next month. Safari in Namibia, then over to South Africa, so Heather can meet the people I worked with at the Southern African Wildlife College, last summer. Good to hear from you, Jim – and best wishes for the book! 2. I want to make sure I’m down on the list for the next in the Kydd series. The collectors, signed one. But with the new email address. Everything else remains the same. NOTE: From 7th June 2016 O2 are closing down their email accounts. 1. As the process is automatic (it needs to know which computer to send it to and can only be signed up from your own personal machine) I regret I cannot sign up people to my blog from this end. If you go to the website it’s pretty straight forward. You just click on the “Follow My Blog” on the right hand side of the page and take it from there. 2. Have added your name to the list and will be in touch later in the year with details. Thanks, Bill – from time to time I incorporate a verse or two from sea songs into my stories. You’ll no doubt recognise them! 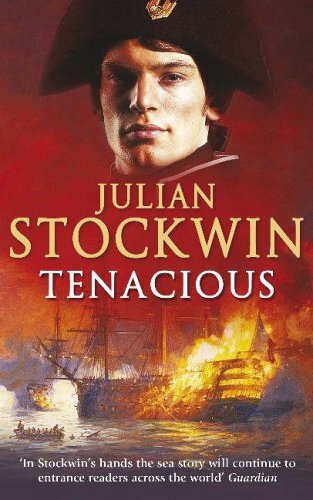 Delighted to be reminded of Tenacious one of my favourites in the Kydd series. Could I ask a question that occurs to me every time I read it in the novels? The name of Renzi, Lord Farndon’s ancestral home has always been a puzzle to me. Eskdale Hall is situated in Wiltshire where I now live and yet every time I read the name I am reminded of the Dales in other parts of the country and of the Rivers Esk in Cumbria and Yorkshire. How did you come to choose this name for Nicholas’s family home? Delighted to hear you enjoyed TENACIOUS. The name Eskdale Hall was chosen by one of Renzi’s more eccentric ancestors who just liked the sound of the name; there was no particular significance to his choice.